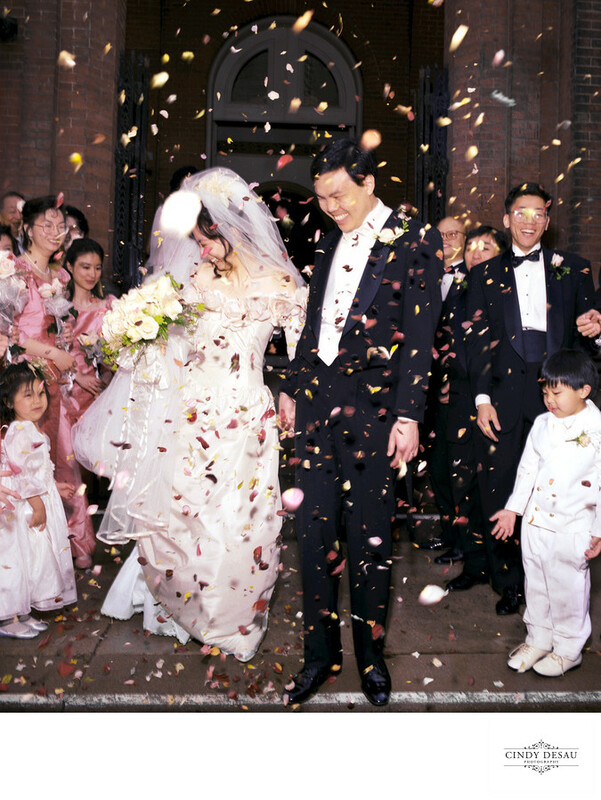 The guests at this Chinatown wedding in Philadelphia tossed a lot of confetti and flower petals to this bride and groom as they left the church. I shot this photojournalistic manner and recorded as the post-ceremony events unfolded. This bride wore at pale pink wedding gown and, as is customary in Chinese culture, changed into a red dress for her traditional wedding reception. Chinatown in Philadelphia is a bustling Asian American neighborhood that represents Hong Kong, Cantonese, Fujianese, Northern Sichuan and Taiwanese cultures, as well as Korean, Thai, Malaysian, Burmese, and Vietnamese. The neighborhood stretches from Vine Street on the north to Arch Street on the south, and from North Broad Street on the west to North Franklin Street and North 7th Street on the east.